It pupated; it looks like the exuvium was ripped in halves, one at the front and the other at the back of the pupa. Update 3/1/2012: This is not the lep pupa but a parasitic fly's puparium. The remnants of the caterpillar can be seen at both ends. 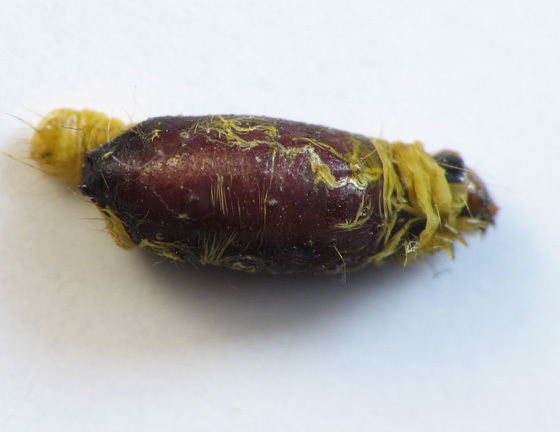 What is shown in photo #394663 is the puparium of a fly, which in its larval stage fed as a parasitoid inside the Agonopterix caterpillar (the remains of which are seen at either end of the fly puparium). Aha! I should have noticed that. Now, it becomes obvious. I will move this image.